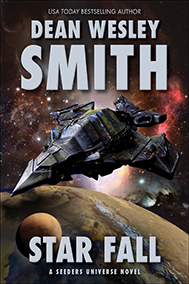 USA Today bestselling writer Dean Wesley Smith returns to his fan-favorite Seeder’s Universe series with a seventh novel, Star Fall. Seeders never do anything in a small way, including their sports. Matt and Carey, the chairmen of the Starburst ship Star Fall started a yearly relay race from the very front of their ship to the tail and back again. An extreme relay of over nine thousand kilometers run by ten-member teams. But before the race could start, a scout ship vanishes inside a shielded galaxy. Who could put a shield around an entire galaxy? And why? A galaxy-spanning tale of adventure, suspense, and the vast possibilities of space.